Final Fantasy VII comes to iOS finally. 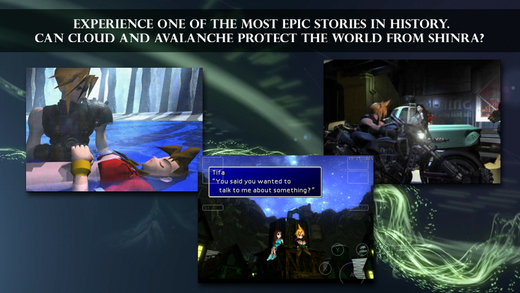 The smash hit RPG: Final Fantasy VII, which has sold over 11,000,000 units worldwide, finally comes to the iOS! The game is now on sale in the App Store on iTunes for $19.99. This game is a port based on Final Fantasy VII for PC (No changes or additions have been made to the story). The first Final Fantasy to feature 3D backgrounds and CG movie scenes, this dramatic tale continues to be loved by numerous fans around the world. Battle stages also appear in full 3D for the first time, bringing an even greater sense of awe and spectacle to combat! Customize your characters in any way you like using the fantastic "material" system that allows endless combinations of spells and abilities. + Play using a simple and comfortable virtual controller designed not to obscure the action, choosing between virtual analogue or fixed 4-way digital control pad options. The opacity of on-screen controls can also be adjusted from the Config Menu. + Two new features to make play easier and more convenient!